If you're looking for an Easter dessert that's unique and kid-friendly, consider this: Peeps, that quintessential Easter candy, are utterly transformed when using as a filling for a s'more, the traditional campfire dessert. The sugary chicks change from soft, springy marshmallows—admittedly, ones without much flavor—to crunchy candies with a caramelized sugar taste on the outside and a wonderfully gooey texture on the inside. The toasted peeps are paired with crunchy graham crackers and melting chocolate to make ​s'mores—or perhaps you should call them "s'meeps"—like you've never had them before. Turn on your oven's broiler element, and place the oven rack in the center of the oven. Line a baking sheet with foil. Break the graham cracker and the chocolate bars in half so that they're squares. Arrange 12 graham squares on the baking sheet, and top each cracker with a square of chocolate. Place a Peep on top of each piece of chocolate. Once the oven has heated up fully, place the tray in the oven for 35 seconds—don't walk away because the cooking process won't take very long. Check on the s'mores after 35 seconds to see how the Peeps are toasting. The candy should have slightly puffed, look melted around the sides, and begun to form a golden brown crust on top. If the Peeps don't look quite melted enough, leave them in for another 5 to 10 seconds, but keep a close eye on them so the dessert doesn't burn. Remove the tray from the oven and immediately top the Peeps with the remaining graham squares, pressing down on them to squish the marshmallow out to the sides. Enjoy immediately. 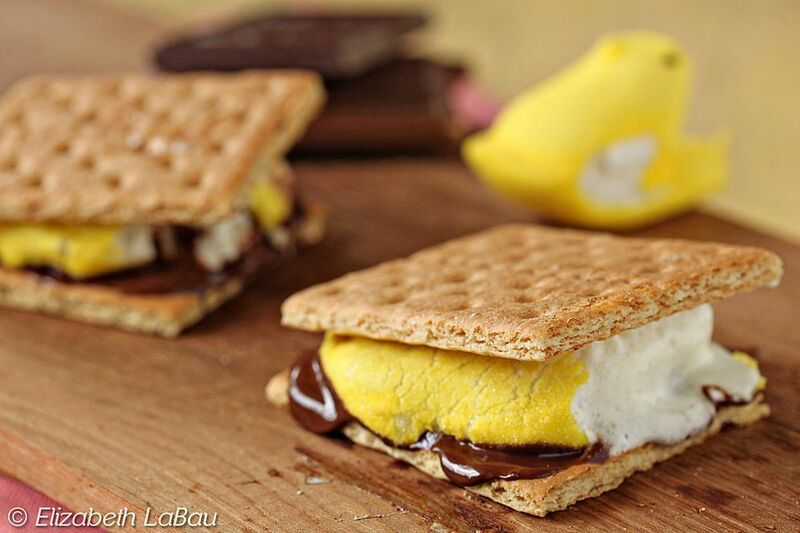 Peeps S'mores don't save very well, so make these to order and enjoy them immediately. If you want to make these around a campfire like you would with traditional s'mores, spear the Peep onto a skewer and give it a quick toast over the fire before sandwiching it with the graham crackers and chocolate bars. For extra fun, buy Peeps in a variety of colors and let each person choose which hue they'd like for their s'more. For a peanut butter treat, use a peanut butter cup in place of the chocolate bar. Other substitutions could include butterscotch chips, white chocolate chips, or chocolate-covered caramels. If you're pressed for time, make the s'mores in the microwave. Simply put a Peep and chocolate square in between two graham crackers, put it on a paper towel or small plate, and microwave the treat for 20 seconds. Squash it down when you take it out of the microwave, and enjoy it.